What started as a one-man business evolved into a multinational with sales in more than 40 countries. Since the establishment in 1965, FERM has been designing and developing high quality power tools in different fields. A power tool is a unique product - not only does the end user develop a relatively intense bond with their chosen power tool; they also tend to own only one product per type. This means that they must be able to depend on it. FERM power tools are available for purchase in more than 40 countries worldwide. Our products are retailed via local distributors who use their existing network to put FERM firmly on the map in their respective nations. An angle grinder is particularly useful for grinding pieces of stone or metal, cutting grooves in walls, or removing rust and abrasions from metal. Angle grinders may also be referred to as a side grinder or disc grinder. FERM stocks an extremely wide range of angle grinders, each with their own unique properties. Due to their compact size, our small angle grinders are ideal for precision work. Our large angle grinders on the other hand, generally boast a more powerful engine, making them suitable for heavier jobs, such as grinding thick steel pipes and concrete. Thanks to their ergonomic design, three-metre long cables and adjustable soft grip handles, working with FERM angle grinders is an absolute pleasure. Buy today and discover for yourself just how incredibly comfortable they are to use. FERM is a renowned power tool brand from the Netherlands. 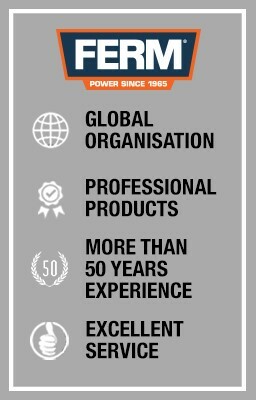 Since 1965 FERM designs and develops high-quality power tools and accessories for the international power tool market. Through 50 years of experience they know exactly the needs of each user. As a result FERM meets the demands of the construction world with a varied selection of unique, reliable and above all powerful machinery to help the professional user meet their high standards.